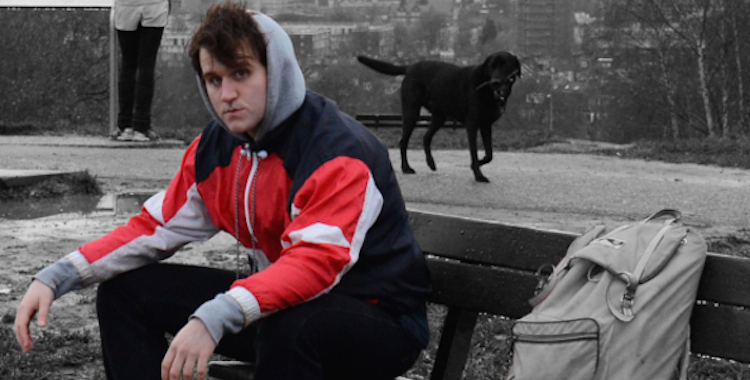 Harry Melling has an ear for the poetic and an eye for the gritty. His debut play has a little of both. It opens with him swinging from a lamppost, body straining upwards while coloured lights pulse around him. A moment later, he’s on the ground and in the dirt, gathering up the detritus of the night before. These two images capture in miniature the existence of Melling’s nineteen-year-old door-to-door salesman: a boy reaching upwards but forever pushed down. Peddling is a slippery, shimmering thing, its wordy, meandering text requiring concentration but rewarding the attention it demands. There are moments when both rhythm and language are briefly reminiscent of Kate Tempest, with that same delicate skill of spinning lyricism from the urban and everyday. Melling’s pedlar boy, a young offender set to work hawking j-cloths and loo rolls (“life’s essentials”), could be a brand new ancient; a trampled god of 21st-century London, flinging poetry and unexpected wisdom into the unheeding night air. Inside the gauze walls of Lily Arnold’s set, the action of Peddling appears hazy, as if trapped behind the gloom and smog and anonymity of a city seething with people. Traipsing through London with his wares – “professional doorstep-hopping” – Melling’s protagonist bears witness to a stratified urban landscape, where the cosy, affluent households of Hampstead and Muswell Hill sit in stark contrast to those who come knocking on their doors. For all the fancy postcodes he names – those telling little combinations of letters and numbers, freighted with social significance – in Steven Atkinson’s production the Boy (he’s never named) stamps in circles around the same sorry patch of earth. Round and round. In one of those comfortable houses with its comfortable postcode, the Boy comes across a ghost in the form of a woman in the form of a social worker. She doesn’t recognise him, but he recognises her. This sudden, destabilising encounter offers opportunity for destruction, answers and redemption, with the Boy seeking out a little of each. Melling has us follow him as night melts into day and day melts into night, tracing the winding path he takes on the search to understand his past, his present and his future. What Melling is strongest on is the sheer, crippling indignity of not being recognised as a fellow human being. His protagonist is denied a name and a place to lay his head, cast out onto the uncaring streets with just a badge on his chest and a box of items for sale. His life is reduced to transactions. He knocks on doors. He sells dishcloths and buys fags. He receives the sum of his life in a box full of papers, thrust into his arms with the words “this is you”. Just a series of notes and records, the traces of his long exchange from hand to hand, institution to institution; “a long list of yesterdays”. When he begs for his name to be acknowledged, crying “I am something made of flesh and blood”, it rings out with rage and desperation. Elsewhere, though, Peddling can be a little heavy-handed with both its points and its symbolism. When we get a glimpse of the Boy’s childhood, the loss-stained memory of innocence feels all too familiar, recalling a trope seen many times before. A long interlude describing a dream, meanwhile, shows the strain of reaching for profundity in a way that the rest of the play doesn’t need to, leading the attention to drift. The real poetry here is in the pedestrian, its power generated by a distinctly and devastatingly everyday despair. And through it all Melling’s restless, intermittently explosive protagonist prowls like a caged thing, stamping down the dirt and blinking up at a city sky that has swallowed all the stars – “a punishment for not taking good enough / care of one another”.